Reason for inclusion: This is one of my biggest horror blind spots. It appears that I watched Carrie at the best possible time, and not just because we are rapidly approaching Halloween. No sooner than the very next day after finally seeing Brian de Palma’s seminal 1976 adaptation of the Stephen King novel, I was forced to watch the trailer for its upcoming remake. Not only did the trailer give away the entirety of the film’s plot (complete with multiple shots of the penultimate prom scene), but it just reinforced the idea that a remake is entirely unnecessary. I knew the general plot going into Carrie, and I had seen clips of it over the years, but I was surprised at just how sad of a tale this is. While still a horror film, it’s not really what I expected of the genre, as it plays out as more of a drama/thriller. 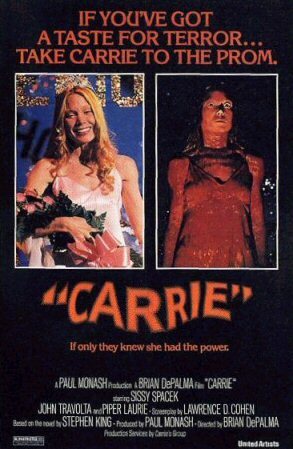 Sissy Spacek (in an absolute jaw-dropping performance) stars as Carrie White, a timid and awkward 17-year-old high school student. She is an outcast at school, almost entirely due to the extreme religious views her mother Margaret (Piper Laurie) forces on her at home. Poor Carrie is forced to learn about puberty on her own (i.e. her first period, which horrifies her and is shown in the very first scene of the film), and her mother dubs her a sinner for this. The 17-year-old is constantly bullied at school, further making her life miserable. However, things start to look up when one of the girls, Sue (Amy Irving), has a change of heart, feeling guilty about her role in the bullying. She convinces her boyfriend, Tommy (William Katt), one of the most popular guys at school, to invite Carrie to prom. Reluctant at first, fearing this to be a joke, Carrie eventually accepts his offer. Everyone appears to be genuine in their attempts to help Carrie; well, except for two students. Chris (Nancy Allen) and her boyfriend Billy (John Travolta, in one of his earliest roles) just want to torment her some more, and they set out to ruin her evening. Oh, and there’s one other slightly important bit that Carrie is discovering about herself: she has telekinetic powers. Her effects are subtle at first, such as moving a small object, but as she learns more about them, she begins to realize that hey, maybe she can fight back on the constant abuse after all. The film itself is a bit of a slow burn before reaching the chaotic final act, but it still presents itself as a fascinating character study. We can’t help but empathize with Carrie, and her character is a strong encapsulation of the life of a teenager (albeit a bit more extreme than most). 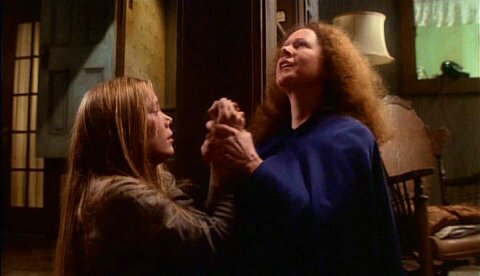 All of the praise given to Sissy Spacek’s performance is well-deserved — those eyes will haunt me forever — and Piper Laurie is also terrific as her religious nutjob of a mother. Carrie truly does stand the test of time, and while the fashion may be dated, the tale itself is not. This is a damn good horror film and one of the finer de Palma works that I have seen. It’s a shame that the remake will likely be the next generation’s introduction to this classic story. Im not really looking forward to the remake. I feel they will just add the typical computer graphics and good quality to make more money. I will most likely see it but not in theaters (maybe red box) unless I hear it is spectacular. I wish they would stop remaking good movies and focus on making some newer movies less crappy. Completely, 100% agree with you. I have no interest in the remake at all, and it is really disappointing that it will likely be the next generation’s introduction to Carrie. I just can’t imagine the new one being any good. It will be similar look and feel to all the newer movies that the new generation enjoy so they may like it. I feel they will never really appreciate the movie and its worth unless they watch and really pay attention to the original. Which is disappointing because unless they are really into movie production or the older style they will probably not like it as much since it isnt what they are use to. Such a shame. Sad but true. I know too many people who scoff at the idea of watching anything pre-80s (or even later). I can’t say I have any hopes for the RoboCop remake either.. that one looks especially awful. Love this movie. So classically made, written and photographed. 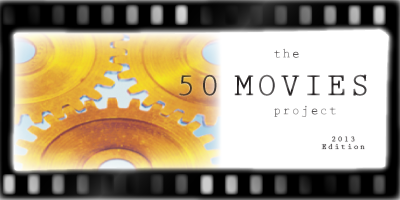 Many films are not just made like this anymore. I love De Palma’s later films better but Carrie is in the stratosphere all by itself. Good review! Thanks man. I still need to see more of De Palma’s work, but this one really impressed me. So glad you liked this one! It’s in my top 20 of all time. The whole movie is such a masterpiece – the way it is shot, the music, the two main performances…it’s one of the most well made movies out there. The remake is going to be an abomination. Haha, I agree about the remake. Top 20 all time, wow! I think this film will grow on me with each viewing, too, and it really seems like one that is infinitely rewatchable. A great film no question. No remake will top the original, especially not Sissy’s Spacek’s stupendous performance. I recently watched De Palma’s Blowout, and that was pretty good too. I love the concept as well as the approach to sound, even though I recently discovered it was a reinterpretation of a Michelangelo Antonioni film called Blow Up (that I should get too soon). Thanks, Niels. The casting in the remake is just bizarre, too. I mean, Chloe Grace Moretz filling in for Sissy Spacek’s role? She’s a good young actress, but I’m just not buying her in that part. Glad you enjoyed Blow Out, too. That was one of my favorites from last year’s project, though I still need to see Blow Up. ‘Carrie’ has been on my personal list of films not to be re-made, re-interpreted or re-imagined for decades. What’s there is fine and doesn’t huge pyrotechnics or CGI. Or a second or third look. And a heads up to Big Blog. John Lithgow is superb as the “fixer” in Blowout! Thanks, Jack! There really is no reason to remake Carrie. Unfortunately, all Hollywood sees is $$$…. Good review, Eric. I loved the visual style. Indeed a great performance by Spacek, agree we empathize with Carrie. It was good, but I think I would’ve liked it even more, if I had discovered it at a younger age. But I guess anyone who has been builled (or felt like an outsider) can somewhat identify with Carrie’s situation. Saw this years ago but I don’t remember the details. Surely the bloodied Spacek is quite an indelible and iconic shot though. Yeah, what an unforgettable shot that is. I can’t imagine anything in the remake being able to live up to that. Not looking forward to the remake. I mean, the trailer pretty much gives the whole film away, ha. I can’t blast the remake too hard on the spoilerific trailer since — at least going by the poster — the original was marketed pretty much the same way. Still, I don’t think it needs to be remade. Great review, Eric. I had to swing back here after I watched and reviewed the film myself, and it looks like we’re in agreement on a lot of points about the film. You’re right that it’s really a sad story more than a horror story. Thanks, Morgan. Yeah, this one was a bit of a surprise to me since it wasn’t the type of horror I had been expecting. But it made for a great film nonetheless. There is a certain arrogance when it comes to these remakes. The whole: “It’s dated so we need to spruce it up with better graphics and a sped up pace because newer/hipper is ALWAYS better!” spiel. Yeah sure it is…just look at all the corpses these last few years of remakes that were duds (and who very few cared to see). If it ain’t broke…well you know. The original film has entered the cultural lexicon, pretty tough to knock it off its throne. To quote Sue Snell, “let it go…” when it comes to remakes already. So true bro. Even down to the music it seems…is it really that hard to come up with the creepy, atmospheric stuff they used to conjure up back in the day? Generic and unmemorable seems to be the new norm nowadays. Hey! Apologies for not giving you props for an ace review! Nothin’ generic about that lol. And a Happy Horrorween to you! Thanks man! You are far too kind. 🙂 And Happy Horrorween to you as well!